Latest: JAMB 2019 UTME Exam Slip Printing Begins | See How to Print Yours Below. This is to inform all the candidates who registered for the 2019 Unified Tertiary Matriculation Examination (UTME) of the Joint Admissions and Matriculation Board (JAMB) that the portal to print examination slip has been enabled. All concerned candidates are advised to print theirs as soon as possible to know their examination date, time and venue. To print yours, follow the steps below. Enter your JAMB Reg No., email address or Phone Number (GSM) in the space provided. Click on ‘Print Examination Slip’ to print your slip. Note: Don’t forget to print your slip, as it will be required of you at the venue of your examination centre before you’ll be allowed to sit for the exam. The Joint Admission and Matriculation Board (JAMB) has postponed the printing of UTME slip to Thursday April 4th, 2019. This was disclosed by the JAMB’s Head of Media and Publicity Dr Fabian Benjamin in an interview with newsmen. Recall that the printing of the examination slips was initially scheduled to begin on Tuesday, April 2. This is to remind all candidates who registered for the 2019 Unified Tertiary Examination (UTME) of the Joint Admissions and Matriculation Board (JAMB) that the reprinting of examination slip is expected to commence today. According to the board, from April 2nd, candidates will have their slips placed on their profiles. 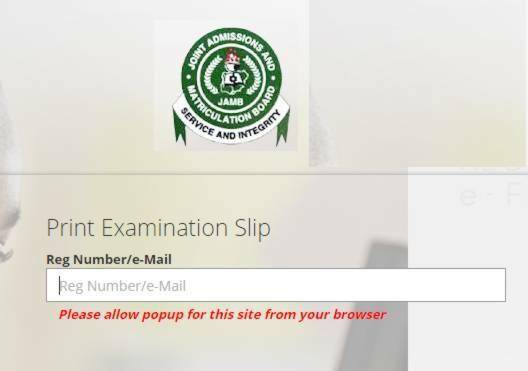 However candidates who are unable to access their slips through their portal can visit the board’s service portal,on www.jamb.org.ng to print the slip. We advise candidates to keep a close watch on their email addresses (check inbox, junk/SPAM Folder) since JAMB may send the exam slip notifications to candidates’ email addresses. Once you get a notification to that effect from JAMB or able to print yours, please do not fail to let us know in the comment section so that others can reprint theirs. We expect the direct portal for the printing of exam slips to be equally enabled any moment from now. Once it is enabled, this post will be updated with the steps to print the exam slip directly from JAMB e-service Portal. JAMB Exam Slip: The Joint Admissions and Matriculation Board (JAMB) has disclosed that the printing of 2019 JAMB Exam Slip would probably commence March 2nd, 2019; that is two weeks before the examination. Note that this date is yet to be confirmed. The reprinted slips will bear candidates schedule for the examination: date, time and centre as well as other necessary information about the examination. The board added that messages would as well be sent to candidates, informing them on when to reprint their e-slip. This processes will be all automated to keep candidates up-to-date with developments. The date for the main examination remains March 16th – 23rd, 2019. Candidates are advised to ensure they are also adequately prepared for the exam. Once the page has loaded, type in your JAMB Registration Number or the email address you used to register for the exam on the specified column. Select “Print Examination Slip”, your exam slip will pop up on the screen. If you have your computer connected to a printer, just proceed to print your exam slip. If you do not, you can either save it in a flash drive and print it in a business centre or just proceed to a cyber cafe and do everything there. As usual, you should print 2 copies of the UTME Examination Slip in Full Colour. You will submit one at the Exam Hall and you have to keep one for reference. The portal may be a bit slow but you have to keep trying again until you are successful at printing your UTME Examination Slip. Please I hope I will get the email soon to proceeds with the printing of ma slip I don’t even understand is it 4 or 14 which is the correct date for the printing of the slip. Chinwendu, sorry about that but you might have to keep trying.